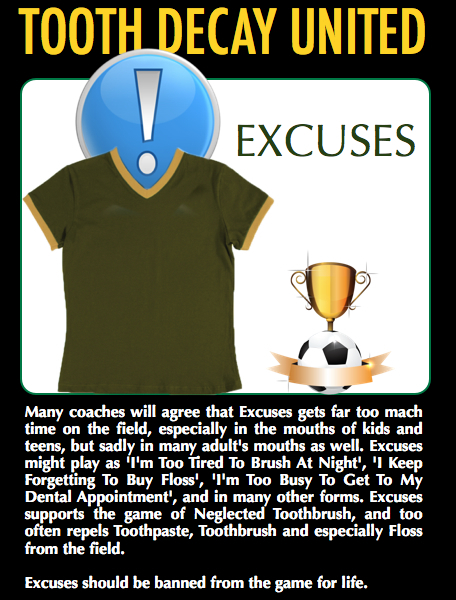 ‘Excuses’ is one Tooth Decay United player that parents and the dental team hear about all the time. Cost, too busy, forgetting to brush, forgetting to floss, fear, feeling ashamed are just some of the excuses people have that prevent them from having good oral health. In the US, a recent survey on nearly 200,000 adults showed that 1/3 (1 out of 3) of Americans skipped visiting a dentist in 2013. In Australia, stats are less, although one in five Australians skipped dental visits. But in this age of smart phones and apps and quantum self (self-growth tools), all these excuses are just that—EXCUSES. Oral health apps make it easier to remember dental visits. There are also apps that tell you whether you’ve brushed enough. And then there are some that send your brushing stats to your dentist! Brushing: There’s An App For That! So don’t let this Tooth Decay United player rule in your mouth. Time to get rid of those excuses!